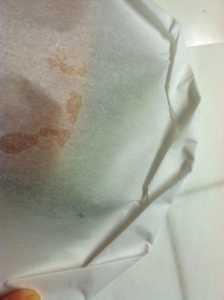 There’s never a dry fish in this house when I use the method I was taught in school for baking juicy fillets or fish steaks in parchment paper. I actually learned it in my dining room class, rather than a cooking lab class. It was this scrambled first semester in which I ended up learning how to make fish en papillote from a brilliant little chef we had teaching back of the house skills to front of the house students in one of our school’s dining rooms. Tableside service was a nightmare for me, as was serving guests, in general. I felt like I was on stage every time I had to approach a table full of guests visiting our restaurants that were open to the public. Cherries jubilee, bananas foster, baked Alaska, Caesar salad, and fish baked in parchment paper were to be prepared or finished by dining room stewards in front of the guests they were being served to. It was a miracle some zany Monty Python type scene didn’t unfold with me in charge of a knife or lighter in front of guests. Fortunately, I never did singe my hair, or receive or inflict a flesh wound, but I hope to never have to serve in the front of the house again. 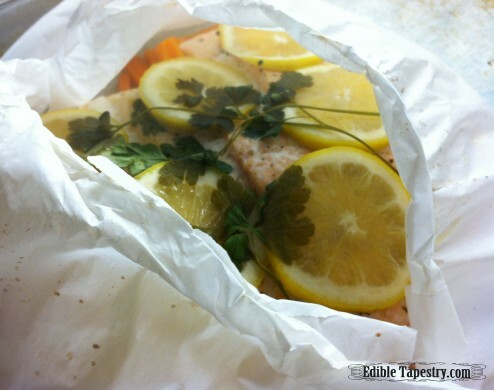 We who were serving on “papillote” day were instructed to take a paring knife to any table that was being served fish in parchment paper, so that we could open the parcels as soon as we lifted the cloche from each dinner plate. By slipping the tip of the knife, blade side up, into the top, we were shown that we could easily zip through the paper and unfold it for our guests. NEVER were the knives we were loaned by the kitchen staff sharp enough. I can still hear the awkward zig-zag shredding of paper from my table and those around me, and the muttering that ensued by the drink station when each of us returned from our tableside duties. Scissors. That’s what I wanted. A good pair of scissors. If you make these, don’t fool around. Just grab some scissors and snip away. And I hope you do make them. They are so easy and delicious! Even my fish-despising husband helped us gobble this last batch up! 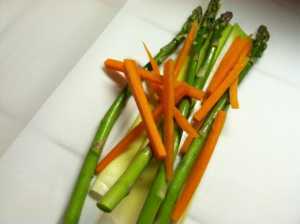 You can use most any vegetable, but I typically throw in carrots, onions, and celery with all that I include. Cut as many parchment paper hearts as you have pieces of fish, just like in art class when your teacher would have you make valentines for Mom. 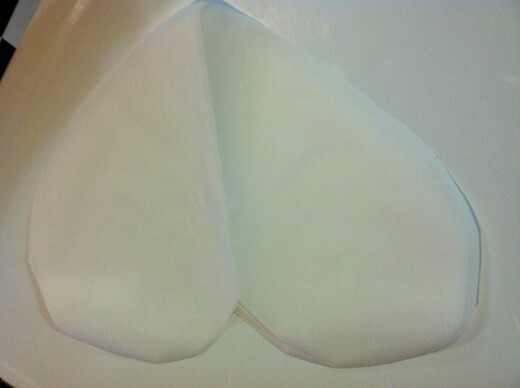 Fold a rectangle in half and cut out one half of a heart shape. Open each up. 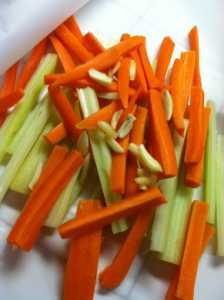 Place a small pile of cut vegetables on one half. 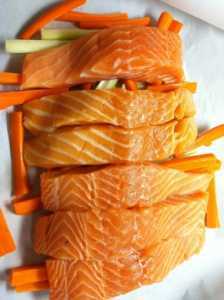 Then lay a fillet or steak over the vegetables. 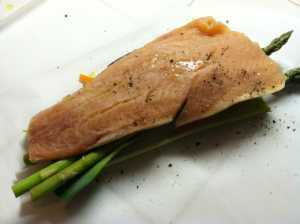 Sprinkle the fish with salt and pepper and give each a little drizzle of olive oil. I just line them up and go one after the other, assembly line style. 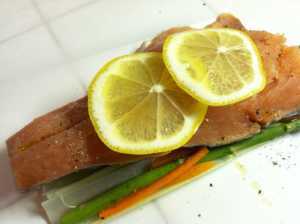 Lay two or three lemon slices atop the seasoned, oiled fish. Add an herb sprig, parsley in this case. 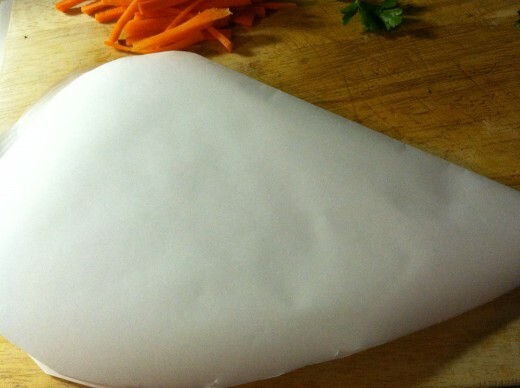 Fold the open half of the parchment over the fish. 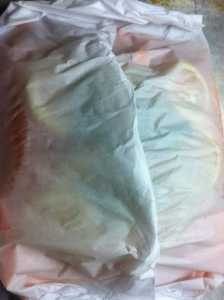 Begin at the top, folding the edges of the paper to seal. Twist closed the bottom, pointed end. 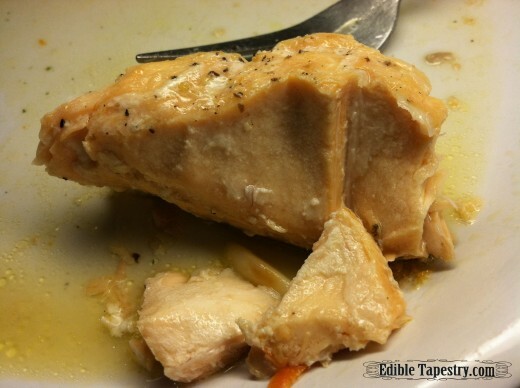 Place the wrapped fish on a sheet pan and bake in a 350 degree oven for 30 minutes. 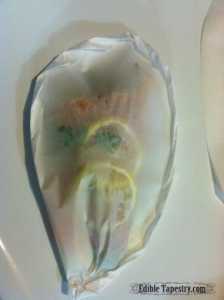 To save time, you can do one large packet, with several fish pieces inside. 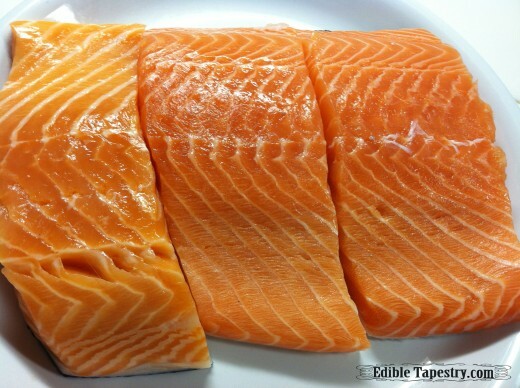 I give the larger size an extra 10 minutes or so in the oven to steam. 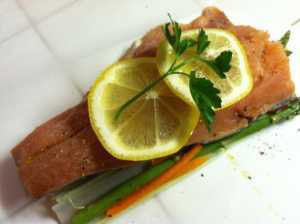 The finished vegetables are full of flavor and just so tender, while the fish is moist and flakes beautifully. Love this! Such a pretty, simple presentation ~ yummy looking, too!